BEIJING, Dec. 6, 2017 /PRNewswire/ -- The diversified development of the world is breaking traditions that have constrained people's bodies and minds, and new things are emerging in an endless stream. It is said that the last changes in the past 500 years of education were the printing press and the textbook. So, how should education of the future conform to the trend and usher in "new life"? These issues were answered at the recent Global Education Summit 2017 (hereinafter referred to as "GES"). Jointly organized by the China Development Research Foundation, Beijing Normal University, Tencent Holdings, GSV and TAL (Tomorrow Advancing Life) Education Group, and under the direct guidance of the Development Research Center of the State Council and the Ministry of Education of the People's Republic of China, GES invited more than 300 distinguished guests in education field from around the world to discuss future development trends of the education sector from multiple dimensions with the theme of "Global Technology Advancing Education". The arrival of the artificial intelligence (AI) era is gradually changing the way people receive education. Facebook founder Mark Zuckerberg has publicly stated that individualized and customized learning will become the trend in the future of education. At this year's GES, the application of advanced technologies (such as Internet, big data and AI) in the field of education became a heated point of discussion. Participants agreed that future technology can help achieve universal education, promote balanced development, drive innovation, promote progress in education, and eventually become an important force leading China's educational transformation. 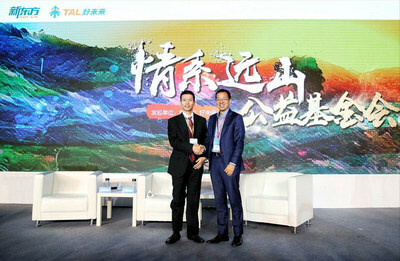 Bai Yunfeng, President of TAL Education Group, emphasized "teaching students in accordance with their aptitude" in his keynote speech, "Connecting the World, Connecting the Future." He pointed out that in the age of AI, teachers will pay more attention to cultivating children's abilities rather than imparting knowledge. In the age of AI, the classroom will be able to more fully and more accurately understand students. 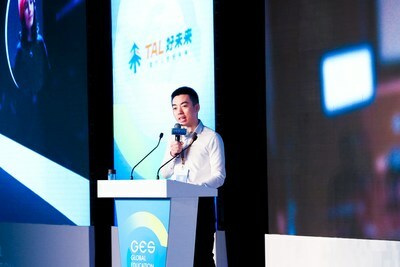 As Bai Yunfeng said, TAL, an educational technology company, has been committed to exploring the possibilities of future technology education reform and has made initial explorations in AI-data and other cutting-edge areas of edtech, online-offline hybrid teaching models, and the trend of symbiosis in public-private education. From ITS (Intelligent Tutoring System), IPS (Intelligent Practice System) to the "magic mirror system" (Expression Recognition Technology), a series of educational innovations and development achievements have made breakthroughs in promoting the transformation from traditional knowledge instruction to personalized and customized learning models. It is worth noting that facial expression recognition and other artificial intelligence technologies have been widely applied in Speiyou, Xueersi Online School and other classes under the TAL brand name. In these classes, the degree of concentration and the attention expressed by every child in the learning process, and their feedback to the effectiveness of the teacher's instruction can be identified in a data-driven and formulaic way. At the same time, the data can also enable teachers to customize personalized learning programs for students and give each student a chance to receive individualized attention. TAL is actively linking the industry to jointly promote the development of artificial intelligence. Not long ago, TAL established the "Tsinghua University-TAL Intelligent Education Information Technology Research Center (AI Lab)" with the Computer Science Department of Tsinghua University. The company will also build a smart class, explore semantic recognition, image recognition, face recognition, emotion recognition and gesture recognition, and gradually expand the research field to the deep application of AR and VR technologies in education. Originally an offline education company, TAL has been actively working on online education in recent years. That is, after the iterations of the teaching system and teaching technology, it will make the online classroom scene more like the vivid offline teaching, so that students can have a better learning experience. Chen Ningyu, General Manager of TAL Education Group's Xueersi Online School, said during GES, "At Xueersi Online School, AI and big data will dramatically improve the teaching efficiency of teachers, enable children's learning to extend from the school curriculum to extracurricular counseling and the family to complete a self-circulation system and get more feedback through big data in order to achieve a high-quality and personalized learning experience." In addition to Xueersi Online School's mature online teaching system, TAL's "double teacher classroom" is the successful implementation of the online-offline hybrid teaching mode, namely a class with two teachers, including one teacher teaching remotely plus a local assistant coaching. It is worth noting that the introduction of AI and big data has made it possible to utilize the double teacher classroom. It can not only enhance students' learning experiences, but also improve their educational efficiency and benefit more students with limited educational resources. For example, the speech evaluation technology has been widely applied in TAL sub-brand ABCtime. The teacher might ask an English question for all students to answer. In this situation, voice evaluation technology breaks through the limitation of traditional manual answer feedback, and can effectively tell whose answer is right and whose is better. This means that, with the help of AI and big data, a teacher can teach hundreds of students and give each student personalized attention and feedback. "Although it's still a process of interaction between teachers and students, the introduction of the machine enables every student to receive personalized feedback, which will greatly improve the efficiency of the teacher," said Chen Ningyu. A report on artificial intelligence report from the White House said that in future education, thinking and ability will be more important, which will bring more opportunities for educational reform. How to cultivate students' abilities to meet the new challenges of future society in the next 30 years of Chinese education is the focus of the GES. As early as 2014, the Ministry of Education issued its Opinions on Comprehensively Deepening Curriculum Reform and Implementing the Fundamental Task of Morality Education, and proposed that "the Ministry of Education will organize research to propose the core literacy system of students at each phase of learning and make clear the essential characteristics and key abilities students must have to meet the needs for lifelong and social development." In 2016, a research group from Beijing Normal University together with nearly 100 experts from other universities in China, issued Core Competencies for Chinese Student Development in the 21st Century to further clarify the core qualities and key abilities of students in the new era. Based on Core Competencies for Chinese Student Development in the 21st Century, TAL concludes that there are six abilities that K12 students need in the future: reading ability, communication ability, exploration ability, abstract thinking, creative thinking and speculative thinking. President Bai Yunfeng also said in an interview with reporters that basic education in China has always yielded remarkable achievements in the cultivation of knowledge; and accompanied by the promotion of globalization and the backdrop of "AI+" development in the new era, learning and thinking may become the core values of student growth and development. It can be seen that TAL Education Group has grown from only emphasizing learning outcomes to jointly focusing on learning outcomes and ability. In this process, TAL has actively introduced a large number of international high-quality teaching resources, has worked with international authoritative academic research institutions, colleges and universities to develop teaching products suitable for Chinese children, launched many research projects in interdisciplinary teaching, and strives to cultivate talent ready to face the future of the world and cultivate students' "ability to benefit all their lives." In addition to strengthening its advantage in the K12 sector, TAL Education Group also actively focuses on several fields like early and preschool education (Firstleap English, Mamabang, etc. ), quality-oriented education (Mobby, etc.) international education (Xueersi International Education, Shunshun, Kaomanfen, etc. ), the integration of public and private education (Education Cloud), investment (EdStars CEO Entrepreneurship Camps, etc. ), and incubates a large number of education companies. This not only broadens TAL's presence across the whole industry, but also shows the company's attention to the cultivation of children's thinking and ability. With the establishment of the new "technology + education" business, the pace at which the industry is opening up and integrating is gradually accelerating. As an educational technology company, TAL is also committed to promoting a balanced development of high-quality educational resources by using its technological advantages. It has launched a series of active explorations for promoting the integration of public schools with high quality teaching resources, as well as the development of education and public welfare. In recent years, TAL has launched graded English reading and a teaching cloud platform, the double-teacher live classroom, an intelligent parent class and other products and services for the public school market, which have covered nearly a hundred public schools in Beijing, Guangdong, Henan, Qinghai, Jiangsu, Shanghai, Zhejiang, Shandong and other provinces. The series of measures using educational informatization to participate in the reform of primary and secondary school education has shown quite good results, and has been well received by the teachers and students of primary and middle schools. At GES 2017, the English grading reading system "Snowland Reading" built by TAL was officially unveiled. It was announced that the system would be introduced to domestic public schools. He Xuan, the project leader, said that combining high-quality teaching resources with technology would be helpful to solve the current separation between reading, listening and speaking, so that children can get a better learning experience. In addition, at GES, New Oriental Education and Technology Group founder Yu Minhong and TAL Education Group founder Zhang Bangxin staged a wonderful "New Oriental and TAL in Dialogue" as the final guests, and announced that a total of RMB 100 million was invested to set up a joint "Yuanshan Charity Foundation" to jointly explore new modes of public education and to promote the balanced development of China's education with science and technology. Zhang Bangxin said at the summit that the foundation would become an open public platform in the future. He welcomed colleagues across the education industry to join in and hoped they would actively fulfill their social responsibility and create a new educational public welfare ecosystem together so as to contribute to education equity. It can be said that the cooperation between the two leaders in the education industry was an important milestone in the transformation from private independent schools to inclusive education. It will encourage more educational institutions to join together and deliver quality education resources to rural and remote areas in China by means of modern technology in order to contribute to the development and promotion of the education system and education model in China. GES has ended, but the discussion of future education never stops. It is expected that more scientific and technological means and sites of learning will be realized in the future, and a new round of development in the education industry will be promoted. How to use these cutting-edge technologies to arm children with future-oriented and lifelong core qualities and capabilities will also become the responsibility and mission of such education enterprises as TAL.